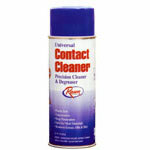 Rawn Universal Contact Cleaner is a fast-drying, general purpose cleaner. It's safe to use on plastic and offers deep penetration. Not for use on energized equipment. No CFC, HCFC or ODP. 9 oz. aerosol can. Case of 12. Product Code: 36211118, Shipping Weight: 12 lbs. per case.